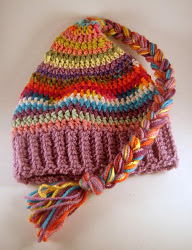 Use up your leftover yarn to make a colorful Scrap Buster Hats for the winter months. This free crochet hat pattern can be adjusted to fit anyone's head in your family. It's a quick and easy pattern to complete using any worsted weight yarn you have lying around. The matching braid adds the perfect finishing touch. Yarn Weight: (4) Medium Weight/Worsted Weight and Aran (16-20 stitches to 4 inches). Do not use a gauge- instead, measure your head for the best fitting hat. Instructions are written for baby/child with changes for (adult) in parentheses. Row 2- sc in BLO each sc across. Ch1, turn. Repeat row 2 until your hat band measures to 1/2inch(1 inch) less than fit chosen head. Tip: End with tails on the same side so you can hide them easier! Match ends and sl st across to seam. FO. Round 1- Join scrap color with a sl st at the seam. Ch2. HDC in the end of each band row around, hiding those ends as you go. Join with a sl st to the beginning ch2. FO. Round 2- Join next scrap color with a sl st. Ch2. Hdc in each hdc, (hiding ends- not gonna keep repeating this- you get the idea) around. Join with a sl st to beginning ch2. FO. Round 3-6- Repeat Round 2 (4) more times. What does it mean to decrease? Decrease means to turn two stitches into one. It's two stitches at the bottom and 1 stitch at the top. In this hat pattern, we are turning 2hdc into 1hdc. To hdc2tog (half double crochet two together) aka DECREASE, you will yarn over, insert hook in the first stitch, yarn over and pull through 2. Yarn over and insert hook into the next stitch, Yarn over and pull through all loops on hook. Round 7(9)- Join next scrap color with a sl st. Ch2. Hdc around, decreasing every 7(9) stitches. Join with a sl st to beginning ch2. FO. Note: It doesn't matter if it's not exact and there are stitches left over. The effect will be the same by the time you braid the end closed. Round 8(10)- Join next scrap color with a sl st. Ch2. Hdc around. Join with a sl st to beginning ch2. FO. Round 9(11)- Join next scrap color with a sl st. Ch2. Hdc around, decreasing every 6(8) stitches. Join with a sl st to beginning ch2. FO. Round 11(13)- Join next scrap color with a sl st. Ch2. Hdc around, decreasing every 5(7) stitches. Join with a sl st to beginning ch2. FO. Round 13(15)- Join next scrap color with a sl st. Ch2. Hdc around, decreasing every 4(6) stitches. Join with a sl st to beginning ch2. FO. Round 15(17)- Join next scrap color with a sl st. Ch2. Hdc around, decreasing every 3(5) stitches. Join with a sl st to beginning ch2. FO. Round 17(19)- Join next scrap color with a sl st. Ch2. Hdc around, decreasing every 2(4) stitches. Join with a sl st to beginning ch2. FO. Round 19- Join next scrap color with a sl st. Ch2. Decrease around. Join with a sl st to beginning ch2. FO. Round 20- Repeat round 8, leaving end tail 1.25feet long. Round 21- Join next scrap color with a sl st. Ch2. Hdc around, decreasing every 3 stitches. Join with a sl st to beginning ch2. FO. Round 22- Repeat round 10. Round 23- Join next scrap color with a sl st. Ch2. Hdc around, decreasing every 2 stitches. Join with a sl st to beginning ch2. FO. Round 24- Repeat round 10. Round 25- Join next scrap color with a sl st. Ch2. Decrease around. Join with a sl st to beginning ch2. FO. Round 26- Repeat round 10, leaving end tail 1.5 feet long. The braid is attached just as you would add fringe to a scarf or blanket. If you don't want to stitch the ends in, you can sew them on after the braid is complete. ivide evenly into 3 groups (there will be an extra one because of the long tail you left, so 16, 17, 16 -or- 20, 21, 20... or, you know, whatever...). I try to mix them up here- not get all the blue, for example, into one braid. Braid to near the ends and knot tightly. Trim the fringe evenly. Alternatively, you could make a solid braid to match (or not match) the hat band.